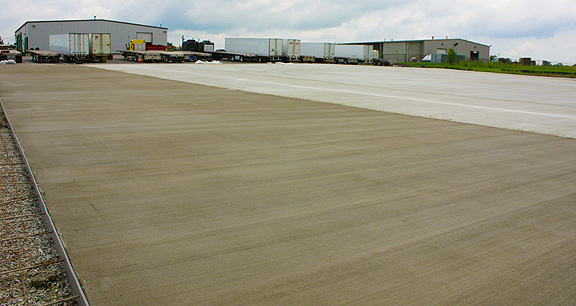 Project obstacles and solutions: JRS Trucking in Georgetown, Kentucky was adding an additional 70,000 square feet to their over-the-road truck parking area. This would make an additional 66 parking spaces for both full-sized, semi-tractor-trailers and bobtails. Burke Concrete Construction was selected as the contractor for this job. One of the biggest challenges on this job was working the pours around very wet weather. There were 1,300 yards of concrete to be poured in six sections. There were eight different times scheduled for pours that were delayed by rain. When the weather broke for a time, IMI delivered up to 200 yards to help Burke Concrete catch up on the schedule. IMI QC/QA used fly ash as a supplementary cementitious material (SCM) in the concrete. The fly ash mix does two things that were critical on this job. First, it does not heat up to as high of a temperature as Portland cement does during the hydration process. This allows concrete to remain workable for a longer period of time. This was important on this project, since Burke Concrete was pouring large slabs. The second benefit of a fly ash mix is it produces fewer pores in the concrete than a straight cement mix. This creates less permeability in the concrete. Water and damaging chemicals on the surface of the concrete have less access to penetrate the concrete slab than in a straight cement mix. Since the slabs were reinforced with welded wire steel, keeping moisture penetration to a minimum was important. This also is a benefit when parking trucks that may have road chemicals that drip onto the concrete. For more information on concrete mixes that increase workability and resist corrosive chemicals, contact a sales representative near you. Click here.